ShibataFenderTeam’s clear focus on in-house design and manufacturing of their high-quality fenders ensures the safety and protection of people, ships, and port infrastructure. ShibataFenderTeam Group is one of the leading international fender manufacturers with 50+ years of group experience and more than 5,000 references around the world. Providing safety critical fender systems, we deliver German and Japanese precision and accuracy, both in engineering and manufacturing. With our own facilities for steel, composite and foam fender production in Germany and rubber production in Japan and Malaysia, the excellent quality of our products sets us apart from our competitors. Our clients always have a competent contact person within reach. Our five offices in Europe, USA, and Asia, are supported by a large network of well-established local representatives on six continents. As a specialist for customized solutions, we stand for experienced support at an early project stage, a long proven track record in the marine construction industry, assistance throughout the service life of the fender system, and testing according to industry guidelines. Creating and protecting value – this is the essence of what our products are meant to do. We offer the full range of marine fender products, from simple rubber profiles up to highly engineered systems and foam products, as well as accessories, fixings and bollards. With decades of experience, we have gained a reputation as a highly dependable partner in the international port, harbor, and waterways market. The ShibataFenderTeam Group has released its first White Paper on rubber compounding which looks at the raw materials used in rubber production, the physical properties of a fender and their correlation with the compound’s composition. The success story of the SFT Group continues in 2019 and with effect of March 2019, SFT opens its 6th office which is based in The Netherlands, located close to Eindhoven. In 2018 the Hutchison Icave Port in Veracruz, Mexico was expanded by a new container terminal. ShibataFenderTeam delivered 50 SPC 1600 Fender Systems, 47 Pipe Bollards and three Rubber Ladder Sets. Since the beginning of the year, ShibataFenderTeam Spain, our Spanish branch, is a Corporate Member of the Spanish section of PIANC, the ‘Asociación Técnica de Puertos y Costas’(ATPYC). ATPYC was founded in 1998 and is one of the many National Sections of PIANC, The World Association for Waterborne Transport Infrastructure. December was a true seminar month for our ShibataFenderTeam. Together with our Indonesian agent, PT Suprabakti Mandiri, three seminars were prepared which took place in Surabaya, Jakarta and Bandung. Calculating the berthing energy of vessels is the first and most important step in the fender design process. If something goes wrong here, the entire waterfront design could be at risk. As part of the many services ShibataFenderTeam offer their clients, their new Tool supports clients during the berthing energy calculation process. As one of the world's leading fender specialist, we consider it our responsibility to do our part for the industry by sharing our know-how with engineers and end users alike. In October, we supported PIANC YPs from Argentina and Spain. ShibataFenderTeam permanently sustains and develops its agent network. On August 29, 2018 the Shibata Industrial Management Board celebrated the inauguration of the Group’s cutting edge, fully owned mixing plant for rubber compounds and fender production in Malaysia with a group of invited guests. The investment of USD 7 Million in predominantly Japanese-made rubber mixing equipment for the new factory is finally in operation after months of detailed planning. Our new office in Spain is not even a year old and we already celebrate two successfully completed installations this year – Cylindrical Fenders for the Port of Málaga and Port of Gijon. 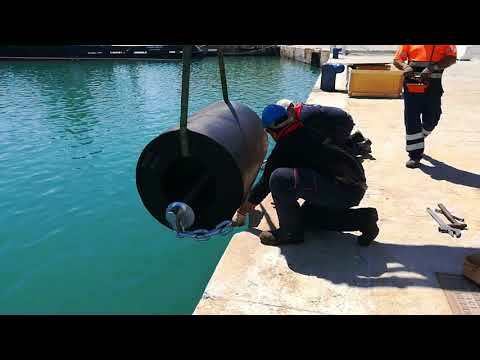 The Port Authorities of both harbors relied on us and were satisfied with our high quality products and especially with our ongoing design and engineering support for their fender equipment. ShibataFenderTeam has a new welding supervisor for the steel fabrication at our production facility in Germany, ShibataFenderTeam Produktion (SFTP). Mr. Helge Wallmuth just successfully completed the course to become a welding technologist according to DIN EN ISO 14731. This additional skill set is an important gain and a further enhancement of the manufacturing quality of our production facility and the entire company. Since 2012 ShibataFenderTeam fenders support the smooth berthing operations from VABI in Surinam. The exhibition series ‘Intermodal Africa’ organized by Transport Events is always a good possibility for ShibataFenderTeam to meet long-standing clients and new potential customers. The German based Headquarters of ShibataFenderTeam recently completed an order for the Port of Esbjerg in Denmark. 27 sets of FE 1000 Element Fender Systems were delivered, as well as 29 sets of Pillar and T Head Bollards with different capacities. In 2017, the US office of ShibataFenderTeam delivered 55 nos. CSS 1450 Cell Fender Systems (G2.0), 8 nos. CSS 630 Cell Fender Systems and several Bollards to the new APM Container Terminal in the Caribbean port of Moín, Cost Rica. ShibataFenderTeam is proud to announce a milestone development for their group. Shibata Industrial, the Japan-based majority shareholder of SFT, has invested heavily in a cutting edge, fully owned mixing plant for rubber compounds and fender production in Klang, Malaysia. The new factory is scheduled to begin production in summer 2018.